About 3 years years ago I painted a empire lowboy in a pretty mustard milk paint and I just fell in love with the design. Every time I run across one of this size, this shade always runs through my mind. I painted another one very similar about a year and a half or so ago…(the one on my header). I scored this one a few weeks ago and naturally I thought of reinventing it once again. I actually have the matching oversized desk as well. I have no design in mind for that one though so I am waiting for some inspiration to kick in. It might sit for a little while. 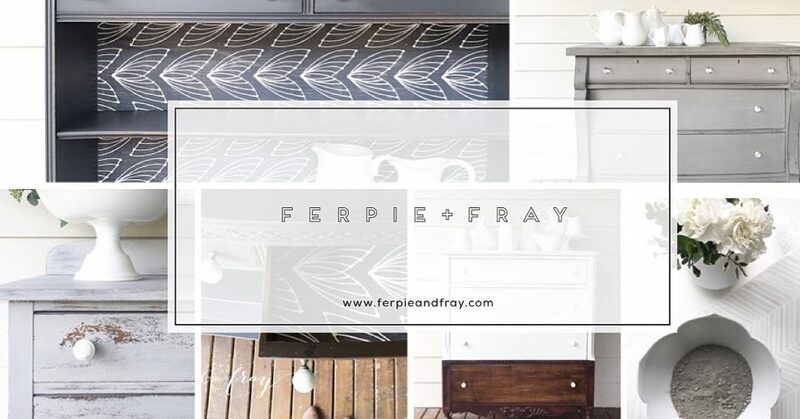 The great thing about milk paint and probably my favorite part is that it is unpredictable and kind of does what it wants… most of the time I really encourage that, and try to stay open minded in my vision. I didn’t sand, or add a bonding agent on this one… I thought it would be great if the paint went chippy and equally great if it ended up more solid. Surprisingly it really held on well to the wood and sanded back really well too. I ended up doing 4 coats and still had a pretty translucent weathered look (which works nicely on these empire styles). Dipped… my new favorite thing. I bought a really great bedroom set a few weeks (maybe months) ago and it came with the cutest chair for the vanity. It was very similar to a dining chair but the back was a bit shorter than average dining chairs. I kept that chair in my mind while I painted both dressers and vanity… I kept thinking how cute it would be to dip just the back to accent how cute it was. I finally pulled it out the other day and thought I would do a quick project. It is so funny how sometimes the smallest projects turn into a point of major inspiration for much bigger projects to come. After I painted the chair I was hooked and had to do a larger scale … the cabinet was a perfect choice because the wood is in great condition. Lately Ive been searching for different. I wanted to do something that would inspire me to try new and make one of a kind pieces that really motivate me to push myself creatively. Maybe it was the contrast of the wood and white… or unusual design but I think its so fun. I taped everything off carefully and primed first… I wanted a very bold white. When I pulled the tape away after painting 2 more coats of paint the line was less than perfect so I actually sanded along the line with a nail file… great tip if you are looking for something to get in a small area that your sanding block can’t reach. It worked perfectly. I then restored the natural finish rather than using stain. I lined the inside, to add just a little more simple character. I think I might be on a dipping craze for awhile. This week I am hustling to finish 5 custom projects (some close to being done) … hoping to finish before we leave to take the kiddos to Portland before school starts up again. So excited to show them all the fun things we found on our last trip. Let me start by saying my friends Devon and Jay are two of my favorite people. They are adventurers at heart, that are always out and about trying new things and exploring. They both have a huge passion for all things old and interesting. I always find myself captivated by their stories and in awe of their giving nature. When I heard the story behind this particular piece I thought it was so magical (more to come on that later). Devon had a really cool vision for this piece that I could not refuse. If you read my blog you are well aware of my feelings on white paint, partically white chippy milk paint. It is the absoulute hardest for me. A week does not go by that I do not get an email from someone trying white milk paint and getting just as frustrated. It’s a delicate balance to get the paint to chip but still allow the white to get really white and yellowing and bleed through is always a risk. So… When Devon asked for white and chippy, I cringed a little. I mean wanted this piece perfect! But I was up for the challenge. 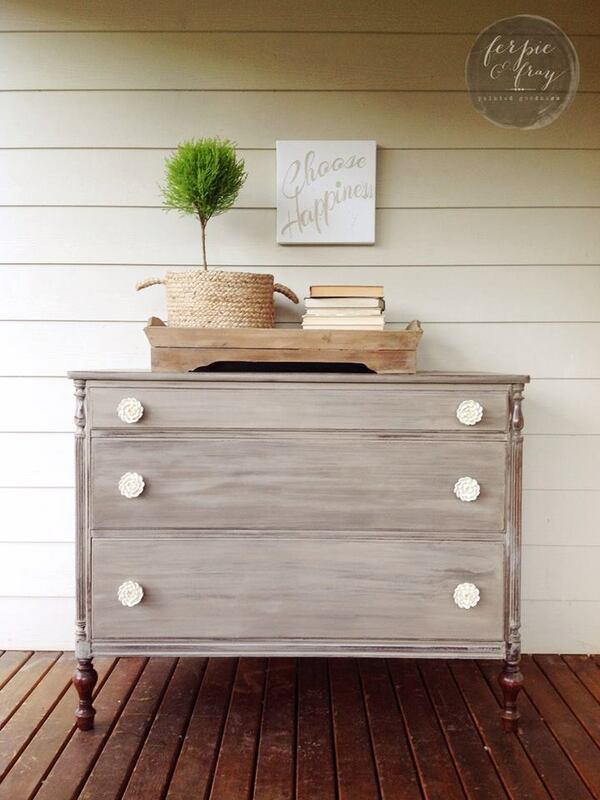 The more you work with milk paint the more you figure out the tricks. Because she wanted it very chippy, I chose no prep at all. 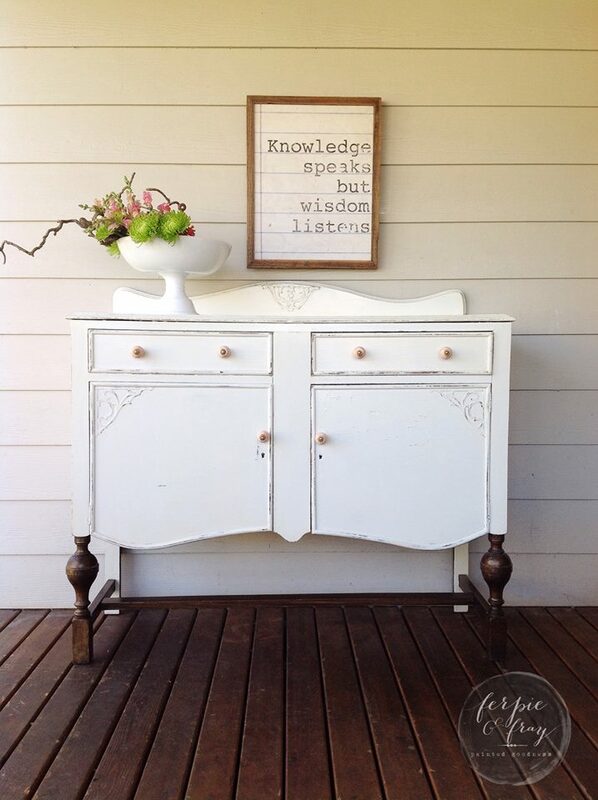 Mixed Snow White milk paint by Old Fashioned Milk Paint Co. and went to town. I babyed her, taking my time with each coat. To avoid an uneven look with the chippy parts I avoided sanding between coats. Around the second coat the paint started to chip…I was so excited to see that it was going in a good direction. I had no bleed through or moments of panic, thank goodness! I carefully painted over the paint that was starting to lift, in my opinion I feel that this is best instead of sanding because you get a nice clean look in the end. After 4 coats, I sanded well with a 400 grit and sealed it with Miss Mustard Seeds wax. This wax is so soft and easy to work with. It doesn’t yellow and goes nicely over any color. 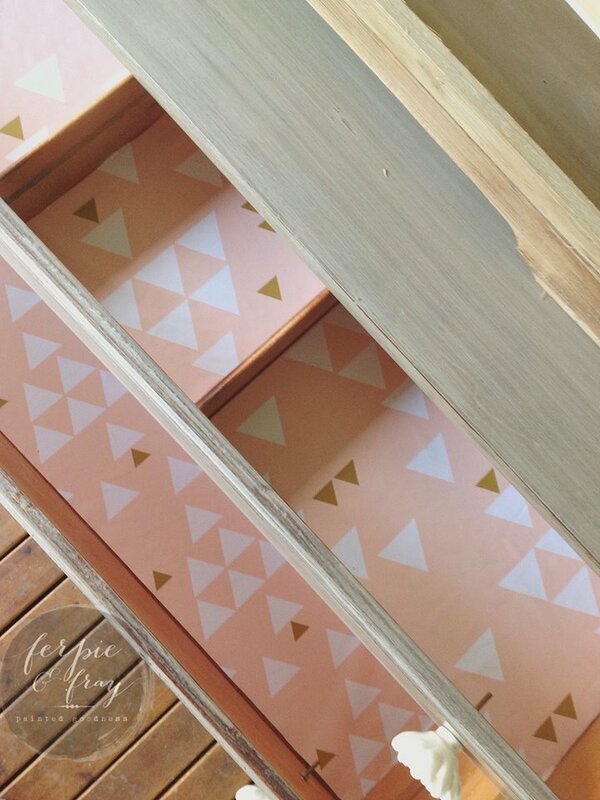 I picked a really awesome Spoonflower paper in a yellow geometric print to line the drawers. This is the story of a life changing buffet. It all started one night in late August 2014. I was having trouble sleeping and was wide awake when I shouldn’t have been, killing time on my iphone app, Varage Sale until I fell asleep. I saw this buffet priced at $100 and in Maple Valley, Wa. where we had lived for the last 7 years. It had been posted for over 8 weeks and I was about 30 people deep that were interested. I sent a message to the seller asking if it was still available and scheduled a pick upfor the following day. Luckily my husband, Jay happened to have that Friday off, which is very rare for him. Off to work I went that morning and he went to pick up the buffet I planned on buying, painting then selling. When I arrived home that afternoon the buffet was in our garage and Jay was eager to get me to go back to meet “the nicest lady” and see her beautiful home and yard. We ended up talking for hours and in conversation she mentioned that they were thinking of selling in the near future. When we heard that we immediately looked at each other and our curiosity was piqued. She kindly gave us a tour of the home and large yard. We saw a beautiful green pasture, turquoise pool, barn, wood shed, garden and lovingly cared for home. My head started spinning. On our way home I was calling my mom and dad nonstop until they answered. The next 2 weeks were a whirlwind. We brought my parents over to view the house and see if they loved it as much as we did. Our good friend Vicki a realtor met with us to give us the comps on our homes and talk to us about putting both our homes on the market. We presented an offer to the sellers of our “dream home” and eagerly anticipated their response. They agreed and a plan was put in action. Jay and I would sell our home, my mom and dad would also sell theirs and we would buy this property together. The plan was to renovate the daylight basement into their home and Jay and I would live upstairs. The next 3 months were packed with showings, lots of packing and purging, loan documents and the excitement building until we could move into the new house. We could not have asked for a kinder more patient couple to be buying from. Both our homes sold in good time and we all moved in together. I sometimes can’t believe how we got here. So many random things had to fall into place. The house was not listed for sale. The buffet on Varage Sale had been on there for weeks and it had a lot of interested people but Every. Single. One. Of. Them. Didn’t. Follow. Through. Jay struck up a conversation that led us going back that same evening to look at more furniture and talk for hours. My mom and dad also saw the potential in this property and jumped right in. Words cannot express how peaceful it is out here in the country. We have two and a half acres, room for animals, room to paint and work on projects and to relax. Breathe. Unwind. You name it, my soul is content here. So this is why the buffet needed to stay with us. My mom thought it would look nice in our entry. Jay and I moved it in and agreed it looked at home there. I sent a picture to my dear friend Amanda and asked if she would paint it for me. Luckily she agreed and I am so honored to have this chippy buffet in my forever home. She created it from the heart down to the smallest of details. The vintage glass knobs that she picked for it, the drawers were lined and she even noticed that one of the doors wasn’t closing properly so she and her darling husband fixed it. She created a piece that will be in my family for many years to come. 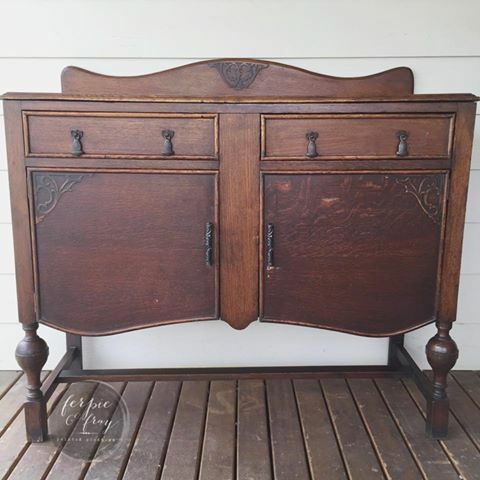 So that is the story of how this buffet changed our lives for the better and also became the most expensive piece of furniture we have ever purchased second hand. Thank you for taking the time to read about Devons lovely buffet, it was truly a pleasure to work on and I am beyond thrilled she asked me to be apart of their story. Check out Devon on Instagram @brideonabike and Facebook to follow along on her journey of awesomeness. This piece had my heart from the beginning. I love little mini buffets like this, maybe because the options are really endless for the design and function. Every time I score one of these babies… I always seem to paint it right away, because I just cant wait! I met the sweetest couple today that came over to buy a dresser. I was telling them about how weird and silly it is that I get so attached to the pieces I work on. I really do. I put a lot of thought into the detail and design and I love meeting people that get that. It feels nice sending my creations to their new homes where it will be appreciated and loved. Each piece is a piece of time that has a long story of places they have lived. Even though they are only with me for a short time, I would like to think that I am fixing and restoring and maybe adding a little beauty before I send them on to another home. This one had a number for repairs that needed to be done. I drove 2 hours round trip to pick her up AND I paid to much for the condition…but I have no regrets. With certain styles, its worth it and I would do it again in a heartbeat. 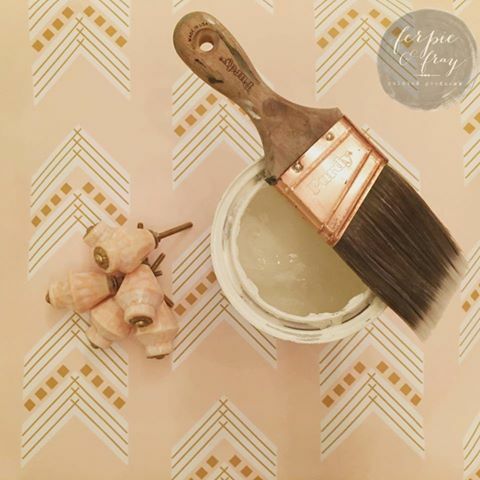 I chose General Finishes Milk Paint in Antique White, beautiful Anthropologie knobs and Spoonflower paper. I actually did a very subtle hint of gold on the legs too! This was so much fun to work on. The details really do make the piece. 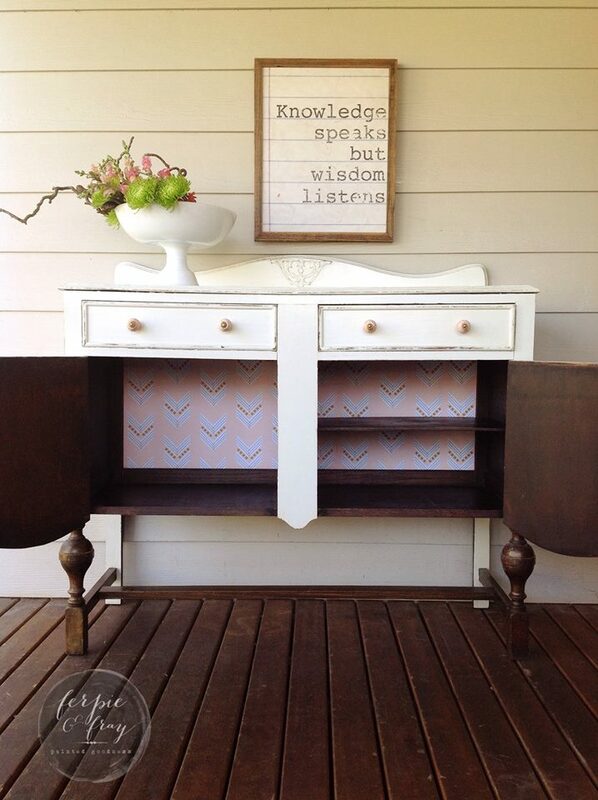 The Anthro knobs and beautiful Spoonflower paper (artist:@ivieclothco) match so well. This paper is a perfect blend of fresh and modern and still subtle, I just love it. 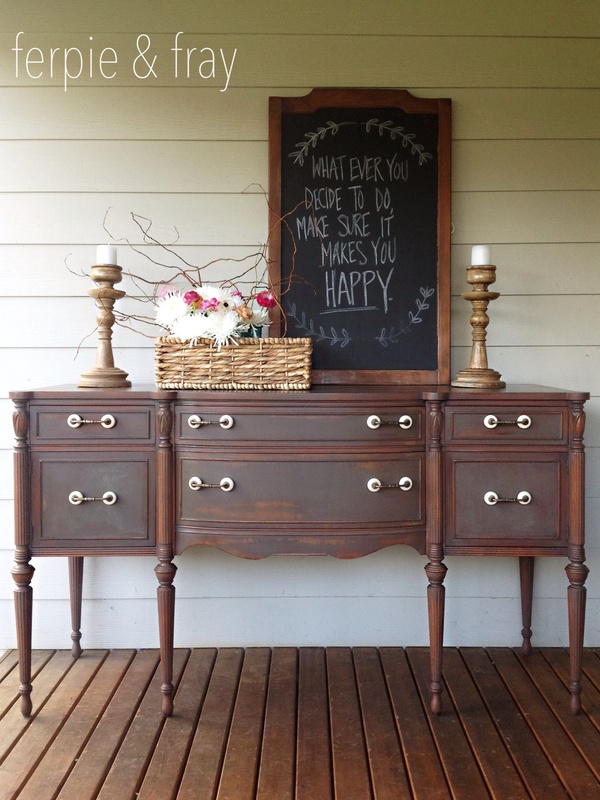 I finished up a beautiful dresser this week by layering different shades of milk paint and I think it turned great! It is a nice way to get dimension to the look of the paint. 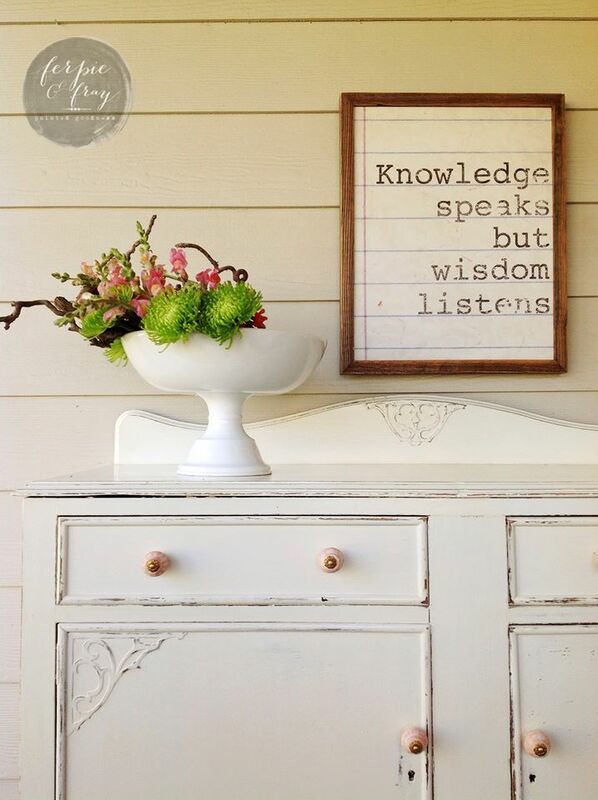 There are a lot of reasons why I love to paint with milk paint. It challenges me a bit sometimes but you can create a really authentic unique patina. With that being said… it can be temperamental and it takes patience but the end result is worth it! 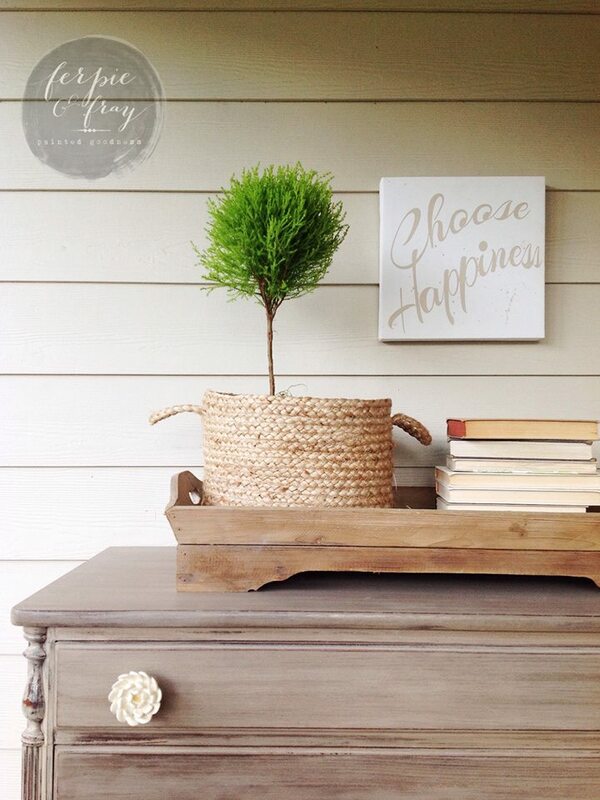 With this piece in particular I knew I wanted to paint it Driftwood by Old Fashioned Milk Paint Co. from the start. I love the way this color looks over a deep mahogany. In my head I kept thinking of this buffet I did about a year ago. This piece was one coat, I used it to sort of create a wash over the warm wood. Here was the paper (from Spoonflower by Elvie & Co.) and knobs (online wholesaler source) that I picked out for the project. The layering idea sort of came as I went. I started with a spray shellac by Zinsser. Which is a great way to “prime” your wood before painting. Then I did two coats of just Driftwood. I was going to stop there. But I decided I wanted a look with more dimension, maybe even weathered. 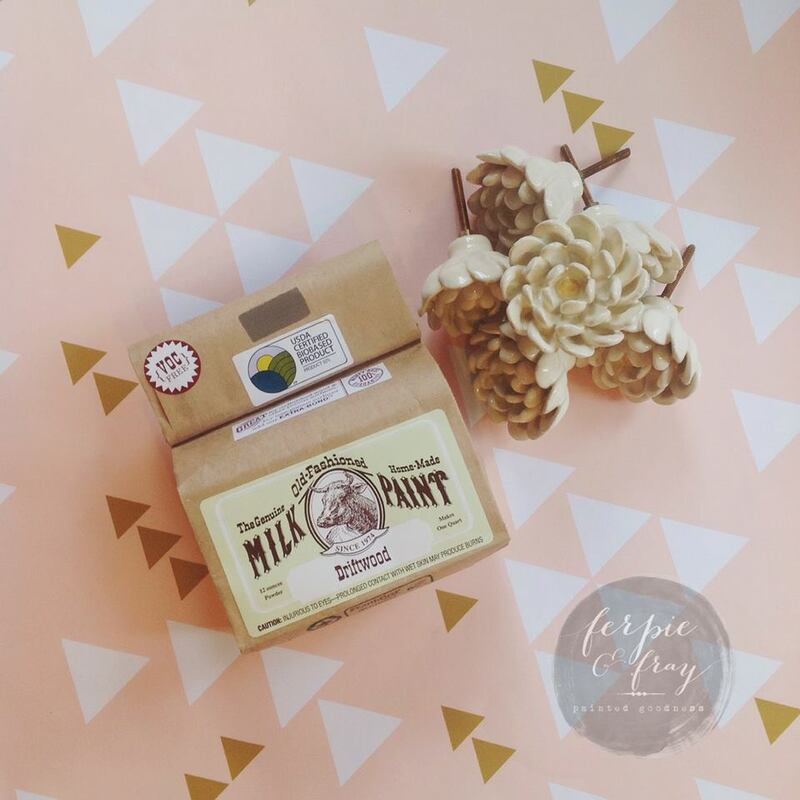 So… I mixed a small amount of Buttermilk milk paint by Old Fashioned Milk Paint Co. into the Driftwood and and painted another two coats of the lighter shade. I sanded well with a 400 grit between each coat to get a really smooth finish. I then finished it with a last coat of just Driftwood and sanded really well to get all the layers to come through. 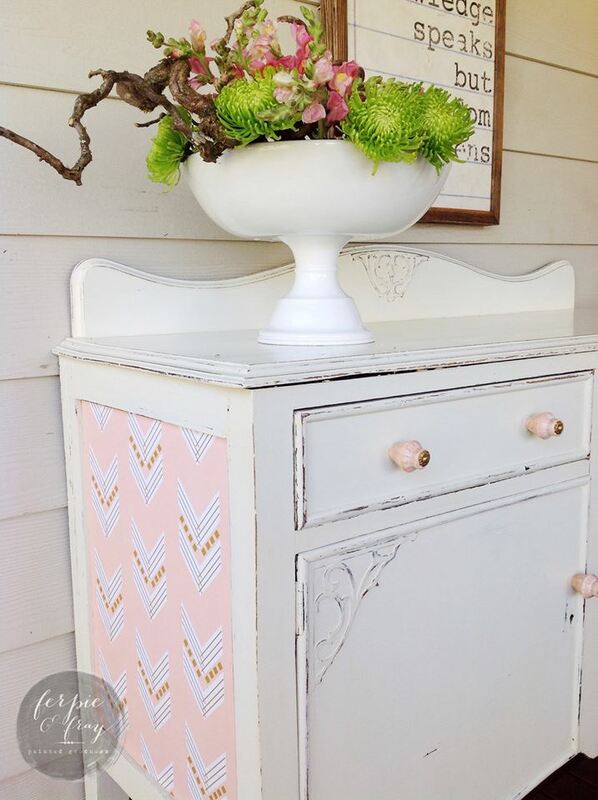 If you have ever painted with milk paint before you know that it sands really well with hardly any work. I sealed it with clear wax from Maison Blanche Paint Company and then buffed really well. I typically only do 2 maybe 3 coats of paint depending on the piece, the layered effect does take more coats.. but its fun to try!